It's Day 3 of Celebrate Mom here at Happy Quilting!!! A fun filled week of daily guest posts and daily fabric giveaway's for you !!! Today, I am super excited to welcome my guest Angela Walters from Quilting is my Therapy!!! I was so tickled to meet Angela Walter's at fall quilt market when I got to hold her quilts for her schoolhouse. I instantly found her to be a wonderfully delightful person and now a friend! Angela is a tremendously talented long arm quilter, author of 2 books, fabric designer for Art Gallery Fabrics, A teacher of countless quilting classes, including virtual Craftsy classes, and a Mom too!!! That is quite the list!!! So without further ado, let's toss it over to Angela!! That was a stab to my heart.....I hate for anyone to think that I have anything together. Sometimes, as a work-at-home mom, I feel like I am hanging on by my fingernails. but, in reality most days it's a little different version at our house. If I had any “secret” to share, it would be that I don’t believe in a the concept of “balance”. I used to always say that I just needed to find balance.....a way to get my work done and spend time with my kids. But then I realized that there is no such thing as balance. My life is constantly changing.....one day, I may be able to get a little more work done. The very next day may be all about the children. I try to take each day at a time and try to find the balance that works within that day, knowing full well that tomorrow may be completely different. Before I go to sleep every night, I try to focus on the things that I have accomplished that day (even if it is just the fact that I took a shower!!) instead of focusing on what is left to do! If I have spent too much time quilting and haven’t planned dinner, my go-to meal is to grab a rotisserie chicken from the grocery store. I heat up some frozen veggies and apple slices. The kids love it and comes together super fast. Speaking of dinner....I guess it’s time to tackle that stack of dishes! And let's finish up with today's Giveaway!!! Today's Celebrate Mom Giveaway is sponsored by The Scarlet Thread Quilt Co. One lucky winner will have this Spring Fat Quarter Collection put together by Julie as their Mother's Day gift!! Don't these beautiful prints just make you want to breath in Spring!! Leave a comment here of your favorite item in Julie's shop, The Scarlet Thread Quilt Co. Thanks for stopping by and be sure to come back tomorrow when Maureen Cracknell will be stopping by and Christa Quilts will be hosting another fabulous giveaway!!! I love the Heather Bailey Fresh Cut FQ bundle...I've always loved that line. Thank you. I love the lime and aqua fat quarter collection. that red & aqua riley Blake bundle. I have a baby quilt to make for a little boy & that would be perfect!! I like this collection and the Heather Bailey FQ bundle. Red and Aqua Fat Quarter Collection. Really like those colors together! I like Moda Good Morning Layer cake. I see a pretty quilt made of that. Like the red and aqua fat quarters. Thanks! I really like the red and aqua collection. It's one of my favorite colorcombos. I like the Moda Snap Pop Layer Cake. Thanks for the chance to win. ahhh I quilt too much too and ignore chores (hanging head in shame) but I do try.... Monday mopping, toilet tuesday, wednesday vaccuuming, thursday tidy up, friday hmm free day. I love the red/aqua combo she has listes as one of the first items. I love the red/aqua collection too! I really like the flowers in the sunshine quilt pattern! Lovely! I love this fabric: Mini Flamingos in Aqua. So cute! I really like the Marmalade fat quarter collection---love that line. I also really like the Simply Color charm packs. Hard to choose a favorite. I still the Fat Quarter bundle of Mama Said Sew. Thanks for this great series and the chance to win! I love that bundle! But I love this Farmington Feathers in Blue by Martha Negley, too. Thanks for the chance! I like all of the chevrons! Thanks for the chance to win! Really like all the Riley Blake chevron bundles. Lovely giveaway. Thanks. Love the Moda Little Black Dress fabrics, thanks for the chance to win! I really love the aqua and red bundle! I love the Lime and Aqua Fat Quarter Collection! Thank you very much for a chance to win! Those Kaffe Fassett prints keep calling me from afar! Great etsy shop, and a nice post to read... I'm currently procrastinating. Love the red and aqua collection. Lobe red and aqua! And who can resist chevrons? Love the Red and Aqua collection. Those 2 colors together have been a huge favorite of mine for a while now. Mmm definitely the red and aqua collection! Although some of the charm sets are adorable too! And the fq bundle up for the giveaway? Gorgeous! My favorite item is the Heather Bailey Freshcut Fat Quarter Collection! Thanks for the giveaway! The Red and Aqua collection! Thanks for the great giveaway! What a great shop! Red and aqua are a winner every time. Thanks for sharing. I`d love to quitl more than I do.thanks for sharing your thoughts. There are many fav`s and I picked Moda vintage modern. The rotisserie chicken from the grocery store is pretty darn good. We have that chicken sometimes for dinner ourselves. We can get either herb, lemon or bbq. Then we have a tossed green salad, french bread and green beans. Very easy and hubby loves it. This has been a fun week and your giveaway is going to be one that all of us really want. Thank you for the chance to win. Your spring fat quarter collection will make a lovely quilt. I LOVE her Flowers in the Garden quilt - and all those Chevrons! Great site! I actually just made a custom quilt based off of a picture a friend saw of one of her quilt patterns :) I absolutely love the mini owls fabric she has available. Thanks for a chance at some beautiful fabrics! Love the red and aqua half yard collection and her Flowers in the garden quilt! Thanks for the chance to win such pretty fabric! I love the Oink a Doodle fabrics. They are just too cute. She also has a lot of dots...I love dots. The lime and aqua fat quarter collection is a great set of fabrics. Thanks for the give-away! Love the red and aqua collection! I love the red and aqua half yard collection. I love the Cherry on Top fabric. Thanks for the chance to win. I really liked Holiday in the Pines. Thank you for the chance to win. The small chevrons by Riley Blake look so fun! Those mini flamingos are ADORABLE!! I love this bundle, and all of the chevrons. Thanks! I like the lime and aqua collection. It screams spring to me! Thanks for the giveaway! The Vintage Modern bundle is pretty or even the red and aqua bundle. I guess there is kind of a theme going there. I'm still a big fan of Vintage Modern and it is harder to find these days, so the fq bundle is my fave right now! Amy Butler Gypsy Caravan Cutting Garden. Love those colors. Red & Aqua half yard collection...I could make so many cute things from those fabrics! Wow, what to choose, what to choose. Everything is beautiful but I really like the Moda Snap Pop Layer Cake. But I love all those turquoise colors in Good Morning Tranquil Turquoise too. Thanks for the opportunity to win the giveaway. I love the custom Coquette bundle, Cuzco, and Riley Blake Willow! I'm really enjoying my Craftsy class by Angela Walters. I'm learning a lot, and I want to doodle all the time! I like the oink a doodle doo charm pack! Oooh she has lovely things in her shop! I love the Flowers in the Sunshine Quilt Pattern. Oh I really loved browsing!! That's my fave though! So cute!!! I like Cherry on Top by Keiki for Moda in Icing! Thanks for the opportunity to win! I like the selection of Amy Butler fabric available. Thanks. WHOA, I just spent 10 minutes drooling over everything in her shop...love all the bright dots & chevrons and the Moda Marmalade has me faint! And Angela Walters is my favorite quilting diva...love her stuff. Thanks for the giveaway; such pretty fabrics. I like Cherry on Top by Keiki. Cute for my daughter's room. I love the Red and Aqua Fat Quarter Collection! I love the red/aqua 1/2 yard collection. Those are my current favorite colors! Sure enjoying reading about all these moms! I love Dear Stella fabrics. Thanks! the winnings look lovely. I love the 8 Fat Quarter Collection of Marmalade by Bonnie and Camille for Moda. Thanks for the giveaway! Thanks for doing this series! Angela's style seems so different from your own - less structured, more "live in the moment." You both make some great points and it's good for us mom's to be reminded of them every now and then. p.s. I like the Superstar Layer Cake. I love the Vintage Modern Layer Cake or the Red and Aqua from Riley Blake. Thanks for the chance! The FQ collection of Coquette by Art Gallery Fabrics is my favorite :) Thanks for the chance to win! I love the red and aqua half yard collection. So pretty. I love the kaffe fassett charm pack, you could make such a cheery patchwork pillow with them! Ooh, Pretty Little Things! Thanks for the giveaway! HELLO! REALLY LIKE THE HEATHER BAILEY COLLECTION>FRESH CUTS! I really like the Superstar FQ bundle. Thanks for hosting! That Sew Mama Sew fat quarter bundle is calling my name. Anything by Amy Butler. Thanks for the chance to win these luscious fabrics. I love the mini flamingos! Just makes me want to giggle! I love the red and aqua FQ collection. Thanks for the giveaway! I really love the Marmalade fabrics! Lovely giveaway,thank you for the chance to win it.Lovely fabrics,so generous of you.My fav are Red and aqua Cherry on top.Have a lovely day. I love the Art Gallery fabrics - so pretty. Thanks! She has a lot of great fabrics, and I'm drawn to many of them, but I was drawn to the Dear Stella Stencil Floral in orange today -- it's not a fabric I recognize, and I really like it! I liked the medium chevrons fabric bundle. Actually, there are alot of fabrics that caught my eye - a Martha Negley with pink roses that looks great with a Kaffe Fassett foxgloves print - nice selection of fabrics! vintage rush brown by art gallery fabrics! Love the medium red chevron print - what a fab giveaway!!! So many great things, today I'm liking the Starflakes & Glitter Stardust in Green by Tina Givens! I really liked the Heather Bailey Freshcut Fat Quarter Collection! Thank you for the chance at this terrific giveaway! I love the Spring Fat Quarter collection, of course. 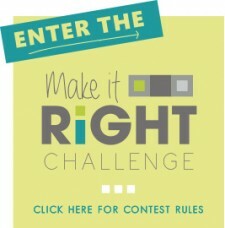 I'll pick the Mama Said Sew collection, but I really like the fabrics that you are giving away the best! Thanks so very much! Love the red and aqua fat quarter collection! The Heather Bailey Freshcut FQ Collection is so pretty! I love the Spring FQ Collection too. Thank you for the chance to win! Ah she still has some Art Gallery Coquette! I love that. One of my favorite lines. I rather like the Maritime Chevron Wave, any colour!! 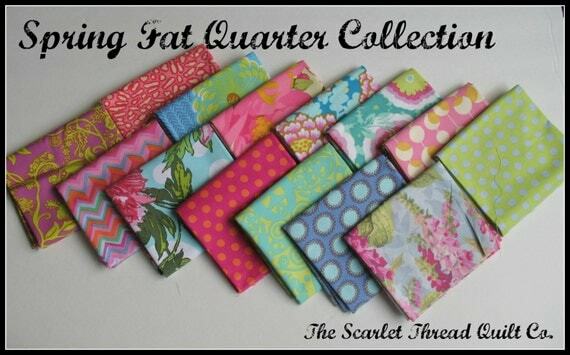 I love the Red and Aqua 9 Fat Quarter Collection. Thanks! Can I just say I love it all?!?! If I have to pick one it would either be all the chevron prints (see it is impossible to pick one!) or the red and teal polka dot fabric! Love, love, love "Alchemy Sketchbook in Spring." Super in love with Amy Butlers Midwest Modern Poppies print!!! Thanks for the giveaway! I am loving this fabric: Michael Miller Cote d'Azur in Denim! Sugar Hill in Lantern Red. Thanks for the chance! I just love the Pretty Little Things Cream Trees! The Heather Bailey FQ Bundle is gorgeous! Ilove twilight peony soul blossom fabric. lovely fabric and some patterns I am considering now. Thanks for this opportunity to win something. The Mama Said Sew bundle is wonderful. Thanks for the chance! Red and Aqua half yard collection is sew pretty, get it sew, ok had my funny, but love it. Thanks for the giveaway! Mama Said SEW - Black White Red - they are really speaking to me lately! I love the Snap Pop Layer Cake...what fun! I really like the Lark Souvenier fabric in ivory & red. Such pretty fabric. I'm in love with Marmalade, so it's easy to say Marmalade's dot in blueberry. :) LOOOOOVE IT! The red & aqua half yard bundle. Love it! Mama said sew FQ set has a great price on it! All her prices looked good. Thank you for the giveaway and of course this lovely Mothers day special! I am like Angela I have no balance. I love all the chevrons. It's hard to choose just one. It's the chevron fabrics that caught my eye! I like Riley Blake's small dots in gray. 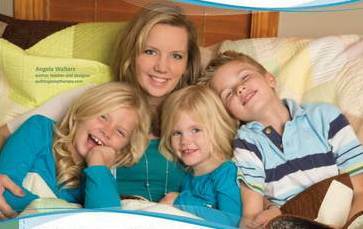 I'm lovin' hearing from all you busy moms out there in blogland. It helps me put my own life into perspective. Thanks! Love Heather Baileys fresh cut bundle. I'm always drawn to the Poetica line. Love the Sweet Melody Pure. Chevrons and Polka Dots!!!! WOW!!!! I love Moda Snap Pop Layer Cake. It's so bright and cheerful! ok....right off the bat I saw the red and aqua with the chevrons...that did it for me!! love those. I love the selection of Amy Butler prints (and on sale, too!). The mini flamingos crack me up! I love the Moda snap pop layer cake. cheery! I absolutely love her Spring Fat Quarter Collection, and after that ... Midwest Modern Fresh Poppies in Fuschia, and Amy Butlers Peacock Feathers in Blush. I am in love with chevrons lately. It became necessary to take each day at a time. I love the Moda Snap Pop collection! Love maritime moby in aqua by Riley blake and the Sweetest Thing by Zoe Pearn for Riley Blake. Thanks for the giveaway and many greetings from Spain! I love that she has Mama Said Sew - love that line!! Thanks for the chance! Oh, today I'm liking Moda Vintage Modern 10 Fat Quarter Collection, they sure look wonderful. My favorite is the giveaway fabric. I already have a project for it. Dear Stell Fez! That's one happy print. I like all the fabric in the Poetica line by Art Gallery fabrics-so summery! I love the lime and aqua fat quarters! I love the Maritime - Hands on Deck in Gray. Thanks for the chance to win! My fav from the shop is the Moda Vintage Modern 10 Fat Quarter Collection. Thanks so much for the chance to win a Mom's Day present!!! My favorite item in Julie's shop is the red and aqua half yard collection. Love it! (I'm going back to favorite it.) Thanks for the chance to win. My fav is the spring fat quarter collection being offered as the giveaway. LOVE Kaffe Fasset. the red and aqua collection is just to die for! I really like the lime and aqua fat quarter collection. Lots of good stuff, but I think I like the houndstooth in pebble (grey) best! I love the Moda Simply Color in Spicy Hot Pink. I love the Red and Aqua Half Yard Collection from Riley Blake. Love the Snap Pop charms from Moda! Thanks for the lovely interview with Angela and the awesome giveaway. I'm leaning towards the Heather Bailey Fresh Cut FQ bundle and I would have to also choose the mini flamingos. i love the Red & Aqua Fat Quarter collections. The lime and aqua fat quarter bundle is amazing! I love the Moda Vintage Modern Fat Collection . . . thank you for a chance to enter this generous giveaway!! I love the Moda Vintage Modern fat quarter collection. Lovely giveaway! I love either the Snap Pop Layer Cake or the Tea Party Quilt Pattern. Thanks for the chance to win. The red and aqua collection is nice, I'm going to try and create something nice for the Right Angles Challenge. Mini giraffes! they are soo fun! Maritime waves- the dark blue one. Love to have that for some of my boy quilts, LOVE the bundle above too!